In what will be the first title defense to ever occur inside the World Series of Fighting decagon, inaugural WSOF and welterweight champion Steve Carl will waste no time putting the validity of his claim to the 170-pound throne to the test when he welcomes former UFC Brazilian leglock (and overkill) specialist Rousimar “Toquinho” Palhares to the fast-growing organization (and yes, the fight is a go; Palhares passed the drug test). A stateside trend appears to be developing for the promotion as well, as the card also features not one, but two title fights; Marlon Moraes and Josh Rettinghouse will square off to determine who the inaugural WSOF bantamweight kingpin will be in the evening’s co-main event. Yushin “Thunder” Okami will also be making his promotional debut, taking on a very tough Svetlozar Savov in a bout that early oddsmakers predict will be the most lopsided matchup of the evening. Also, Josh Burkman will be looking to rebound from his title fight loss to Carl when he takes on Tyler Stinson in what will certainly be among the most exciting bouts of the night. Kicking off the televised portion of the card is a featherweight contest between Mike Corey and Shane Kruchten that is marked by a sizeable reach discrepancy. Fans will want to check out the prelims, streaming on the WSOF website, as they feature an assortment of entertaining talent, most notably the preliminary main event between Azamat “Ozzy” Dugulubgov and John “Johnny Boy” Nunez. Below is a brief rundown of each fight on the main card and, for the first time on this site, I will be giving you my predictions on how I believe they’ll turn out. All odds provided (featured next to the fighters’ records in parenthesis) were taken from MMA Odds Breaker except for Corey vs. Kruchten, whose were derived from Odds Shark. Steve Carl (who gave MMA Owl an outstanding interview recently) was one of the World Series of Fighting’s first acquisitions when they started up back in 2012. After parting ways with Bellator in late 2011, he’s quietly strung together seven victories in a row – all of them first-round submission finishes except for his last fight against Josh Burkman, which he won by triangle choke just a little over a minute into the fourth round. Carl is a proven finisher, and he’s only seen the judges’ scorecards four times in his almost nine-year career (he won three of those decisions). It’s been almost four years since he’s been finished, himself (a first-round submission loss to Dan Hornbuckle, via kimura), and at 29 years old, with this being his 25th professional bout, it’s hard not to argue that Carl is in his prime. He’s the WSOF welterweight champion, for crying out loud, and people are still sleeping on this guy. After being given the old heave-ho in the aftermath of “Leggate 3.0,” Rousimar Palhares’ free agency was over in the blink of an eye when Ray Sefo, Ali Abdel-Aziz and co. picked up the powerful Brazilian fireplug. It wasn’t long before fighters like Jon Fitch began to speak ill of the presence-of-mind-deficient “Toquinho,” and somewhat rightfully so – the guy was a repeat offender. One guy who didn’t complain – as it appears he seldom does – was Steve Carl. 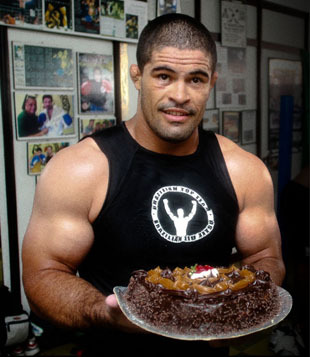 Joe Rogan once opined that yes, Palhares is a one-trick pony, but that that one trick is such a powerful one that it supersedes the necessity to have a better-stocked MMA toolbox. Oddsmakers, at least in the case of this bout, seem to agree with him. I humbly differ, and though it’s unlikely Carl will be the first man to force him to tap, he’ll avoid being submitted long enough to tag the chinny “Paul Harris” and put him out of the game for the night. Prediction: Carl via TKO, Rd. 2. Marlon Moraes is a bad, bad, bad, bad man. The only proof needed is his absolutely stunning first-round knockout (32 seconds into the bout) over an otherwise very durable Carson Beebe back at WSOF 6. Currently ranked by Sherdog as the #10 bantamweight in the world (he and Bellator’s Eduardo Dantes are the only fighters ranked in the top ten outside of the UFC), Moraes has been on a rampage, knocking three of his last five opponents out cold in under a combined four minutes and 16 seconds. It seems he’s found his stride since the spotty four-year period between 2008 and 2012 where he went 5-4-1. Josh Rettinghouse is coming off a tough decision victory over the always-game Alexis Vila, and having won four of his last five fights (with one knockout and one submission among them), he’ll probably give Moraes some genuine trouble. Until Moraes connects with that heavy right hand of his, that is. Then it’s lights out. Prediction: Moraes via knockout, Rd. 1. Yushin Okami was on a three-fight win streak, earning victories over both Alan Belcher and Hector Lombard along the way, but when Ronaldo “Jacare” Souza cracked him with that gargantuan right hand he’d been hiding until 2012, the UFC sent him packing. A perennial top ten middleweight for what seems like forever, it was a bit of a shock when they let him go (MMA Owl’s Mike Fagan wrote a great piece about Okami’s departure, which you can read HERE). This will be his first time fighting since being cut from the promotion with which he’d been since 2006. Facing him is the rather unheralded Buglarian Svetlozar Savov, who last fought in October 2012 while defending his World Free Fight Challenge title in Slovenia. This will be his first time fighting on U.S. soil, however he’s been in Las Vegas for more than a month to acclimate and get some stateside training in. I spoke with him through a translator earlier this month, and although the majority of the interview was unusable (to no one’s fault, honestly; it was a game of telephone, through the telephone, if you catch my meaning), one thing he did mention was his intent to focus more on striking this time around as opposed to his regular grappling-focused approach. If that is indeed the case, he’s in for a long evening. Okami, as a rule, is far from the most emotive fighter out there, but it’s almost a certainty he’s looking to prove Dana and co. wrong on fight night. He may not finish the durable young Zlataritsan, but he’ll earn the win convincingly nonetheless. Prediction: Okami via unanimous decision. Until Steve Carl slapped on that triangle choke, the title fight between he and Josh Burkman was anybody’s game. The loss snapped a five-fight win streak over tough talent including Gerald Harris, Aaron Simpson and Jon Fitch. “The People’s Warrior” is probably just a little pissed, too, that the guy he choked out is already being promised the next shot at the belt, regardless of any outcome on fight night. Tyler Stinson has looked incredible in his last four fights, knocking out every one of his opponents. He’s a tough guy to put away, as well; the last person to do with was none other than the WSOF welterweight champion back at Bellator 26 in 2008. 1. Josh Burkman (who, in an interview with MMA Owl said that we’d be seeing the best fights in his career over the next three years) has never been knocked out. Like Stinson, until his loss to Carl, the last time he was submitted was back in 2008. 2. Tyler Stinson is 6’3” while Burkman stands at just 5’10”. That’s a good deal of reach to be giving up to a guy who hits as hard as Stinson does. Did I mention Burkman’s never been knocked out? There is a first time for everything, of course. It just won’t be on Saturday. Burkman’s too savvy to fall into a striking match with the taller Stinson. Look for him to outmaneuver “The Evolution” in a tightly-contested matchup that’ll leave both fighters exhausted. Prediction: Josh Burkman via split decision. Mike Corey has one knockout win, six submission victories and five W’s by way of decision. He’s been knocked out once, been decided against twice and fought to a majority draw against former International Fight League standout Chris Horodecki (he fought for Bas Rutten and Shawn Tomkin’s Anacondas). Shane Kruchten, on the other hand, has won three of his fights by striking-related stoppage, forced six of his opponents to tap and has won twice by decision. Conversely, he’s lost once by TKO and once by submission (the first and second fights in career, respectively). What stands out about this matchup is reach. Corey, at 5’9”, is of slightly above-average height for his weight class. This means he’s probably used to having a reach advantage against his opponents. That advantage won’t exist against the 6’1” Kruchten who, if he utilizes that reach effectively, should make a successful big stage debut. Prediction: Kruchten via unanimous decision. The preliminary card – which is headlined by what promises to be an absolutely dynamite lightweight bout between Circassian warrior Azamat “Ozzy” Dugulubgov [5-1 (read our interview with him HERE) and undefeated Los Angeles-born Jonathan “Johnny Boy” Nunez [4-0] – features a bantamweight matchup between newcomer Sean Cantor [1-0] and the Hawaiian Bryson Hansen [6-1]; a featherweight scrap between tenured submission specialist John “Guns” Gunderson [34-15-2] and Glendale, Arizona’s Chris “Gritz” Gruetzemacher [11-1]; a featherweight bout between Bryson’s brother, Brenson Hansen [5-2], and the sinister-sounding Boostayre “Bullit” Nefarios [2-1]; a welterweight set-to between Las Vegas, NV’s “Filthy” Phil Dace [9-4] and Danny “Dee1” Davis Jr. [8-8], who is on his first win streak since 2010; and, opening the event up, a lightweight fight between Xtreme Couture’s Gil Guardado [2-0] and Jimmy Spicuzza [2-0], who may be looking for a little bit of revenge, considering his sole amateur loss was to Ryan Couture back in 2009. WSOF 9: Carl vs. Palhares is on March 29th at The Joint at Hard Rock Hotel & Casino Las Vegas in Las Vegas, NV. The main card will air on NBC Sports at 9 p.m. ET/6 p.m. PT. The undercard, which begins at 6 p.m. ET/3 p.m. PT, will stream live from the WSOF website.